Intel gives us a sneak peak at their upcoming Haswell CPU with integrated GT-3 graphics. We also take a look at Razer’s latest Edge Pro Gaming tablet. At the Consumer Electronics Show 2013, Intel gave us a sneak peak at their upcoming Haswell CPU with their new GT-3 integrated graphics. The GT-3 is reported to run twice as fast as Intel’s previous generation Ivy Bridge HD4000 series integrated graphics, so if the rumors are correct, entry level gaming should be fantastic. 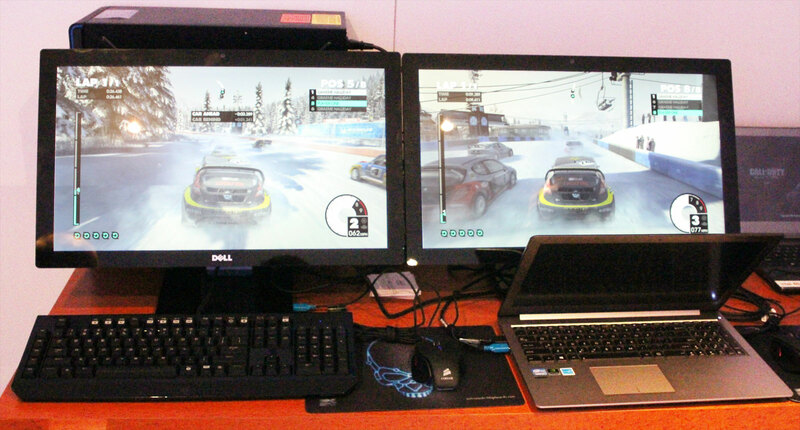 Intel showed us two systems, one running an Nvidia GTX 650m, and the other running the GT-3. Dirt 3 was used to measure the performance of both systems at Full HD, High settings without AA. While performance looked smooth on both systems, the GT-3 did not seem to be as smooth as the GTX 650 was. No final results were reported at the end of the benchmark, but we were also told that driver optimization will also bring higher performance as Haswell gets closer to getting released. Needless to say, Haswell should have enough performance to keep an entry level gamer happy with reasonable performance. While it is not 100% set in stone, we are likely to see Haswell released around April or May or 2013. We’ve came across the Razer Edge Pro Gaming Tablet at the Intel Booth. It’s a good concept, but in all honesty, we were not very satisfied with it. To start off, it’s just like any other Windows 8 tablet, with the exception of having 8GB of 1600Mhz Memory. It’s always nice to see more memory on tablets, but a true gaming tablet should also come with great graphics performance. This is where the Razer Edge Pro really fails. It is running a Nvidia GT 640M, which is a very entry level GPU for gaming. If you were to build a gaming system, you would definitely choose a GPU more powerful than a GT 640. We believe Razer tried to find a balance between the low power consumption and thermal footprint required for a tablet, while also providing the gaming possibility. 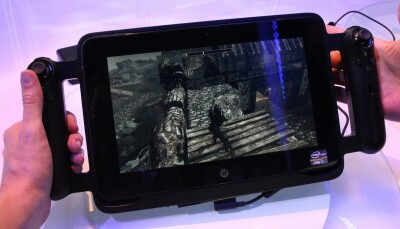 Nonetheless, a “gaming” tablet will not perform well on the GT 640, with many of the latest games coming out on Windows 8. The problem is that many games will have to be downgraded to lower graphics settings, just to make it possible to have a smooth gameplay. 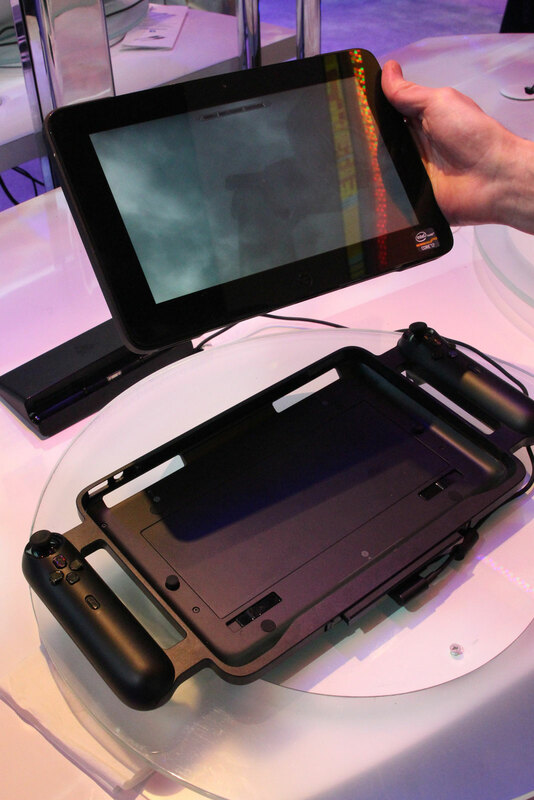 The Razer Edge Pro Gaming Tablet can also be attached in a game controller, or you can hook up a controller to it. You can also bundle it with a keyboard that goes with this specific tablet, or even just get a docking station for charging the tablet. All of these accessories do come at an additional cost. Its crazy price tag of $1299.99 just for the tablet and an additional $249.99 for the tablet controller makes it a very expensive gadget/toy that might not even satisfy a casual gamer.